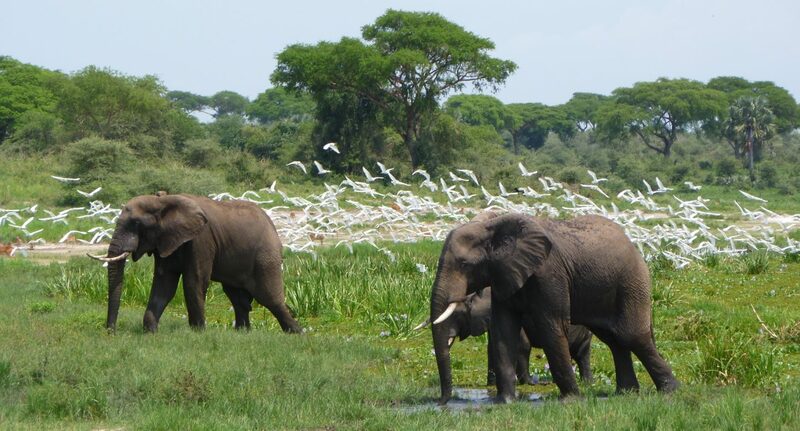 Tusk and the Uganda Conservation Foundation (UCF) have been reducing wildlife crime in Uganda, with a focus on Queen Elizabeth and Murchison Falls National Parks. Illegal hunting for bushmeat and poaching for ivory are huge problems in Uganda. Both Queen Elizabeth and Murchison Falls National Parks contain rich wildlife including elephant, lion, buffalo and crocodile. Driven by poverty and exacerbated by human wildlife conflict, local communities can be drawn into wildlife crime, a situation that can be prevented by supporting them and engaging them in conservation. The project has helped establish food gardens by the boundary of each park. These serve 25 groups of gardeners who are helped in growing a range of important crops not previously available in the area. Community scouts have also been recruited to patrol around both parks to help deter crop raiding animals, particularly elephants. Supporting farmers to keep bees or grow unpalatable crops like chili, ginger or sunflower can do this in a way that also enhances their livelihoods. In order to tackle organised commercial crime, 50 intelligence officers from the Uganda Wildlife Authority have been trained in human intelligence techniques, and nine scholarships have been awarded to legal staff. This has led to significant arrests and improved prosecution techniques. With funding from the UK Government through the IWT Challenge Fund, Tusk has been leading this project in partnership with UCF. We have provided substantial funding for the key activities across both sites. The results have been so positive that we hope to expand several of the activities into more locations. Hunting for ivory and bushmeat are constant threats to the precious wildlife of these spectacular parks. This work needs to continue and grow if we are to keep these animals safe. Click here to read the report on lessons learnt from the community scout element of this project, as conducted by the International Institute for Environment and Development (IIED).